Tasajillo (Opuntia leptocaulis) is a pencil-thin, slender, jointed cactus with long, golden, obvious spines and hundreds of tiny ones barely visible to the naked eye. It grows upright or sprawling and frequently forms large colonies. It is readily spread by birds depositing seeds. The jointed branches take root easily as segments drop to the ground as animals break them off as they travel through. Tasajillo also is called Christmas cactus because the fruit is supposed to turn red in December. My native plant walk co-guide and I keep track of tasajillo around this time of year. Disappointingly, we’ve never seen it as described in plant guides. However, this year, we have cause to rejoice. The tasajillo fruit is turning red in time for Christmas. We’ve speculated about what’s different this year. Perhaps the half day of snow this month and the extended cold temperatures have played a part in this plant decorating the thorn-scrub for the holidays. Tasajillo also is called rat-tail cactus, turkey pear, pencil cactus and desert Christmas cholla. 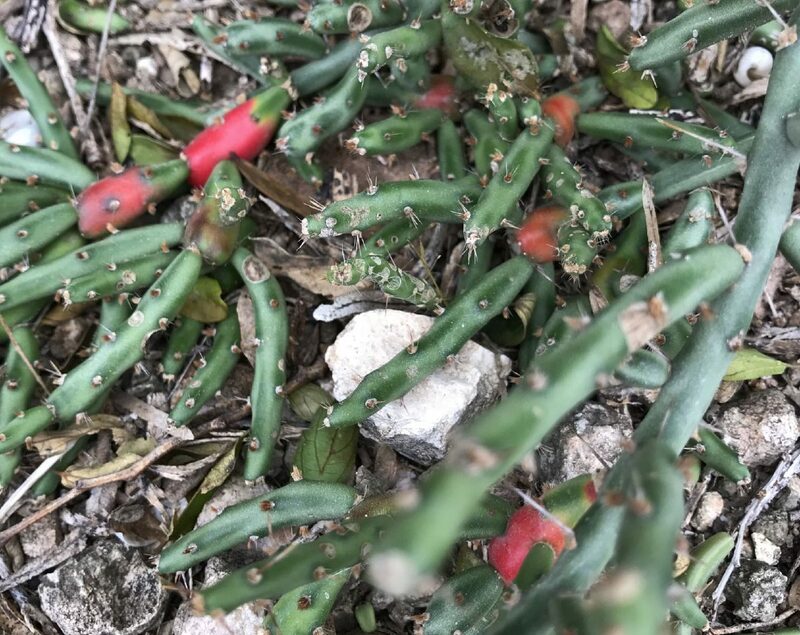 During out native plant walks, we caution participants to keep their distance from the delicate-looking tasajillo because another name for it is jumping cactus. We tease them that it will jump out and cling to their clothes. In truth, the thin, multi-jointed, thorn-encrusted plant easily detaches when disturbed. Don’t pick it off with bare fingertips, you’re sure to get an invisible spine imbedded in your skin. After an encounter with a tasajillo, it’s best to pull the spines using a pair of tweezers, strong light and a magnifying glass. Wildlife don’t have the problems humans do. The fruit is a treat for northern bobwhite quail, mockingbirds, curved-billed thrashers and many other songbirds. Coyotes and rodents also eat the berries. The larger plants provide cover for quail, small mammals and lizards. Other sights where nature appears to have decorated itself for the holidays is with Mexican caesalpinia (Caesalpinia Mexicana). The bright yellow clusters that sometimes bloom into December have all turned into nice golden bunches of seed pod “ornaments,” giving the trees a festive look. The interesting thing about these seed pods is that when dry, they twist open with a resounding “pop” that sounds like distant gun fire. The seeds are shot out of the pods to rain down where they are flung. They are very prolific. Before long, tiny upstarts will surround the mother plant. Mexican Caesalpinia is a popular native tree for home landscapes. The blooms attract hummingbirds, bees and butterflies. The tree is a host for the curve-wing metalmark butterfly. Not to be out-done, Mexican tournefortia (Tournefortia volubilis) is making googly-eyes at all the girls and boys. Not the famed “Silver Bells,” but fun decorations to come upon in our native settings. With a stretch of the imagination, the cold snap has turned Mexican Urvillea (Urvillea ulmacea) into bronze garlands, decorating the trees and shrubs it uses to twine itself through. 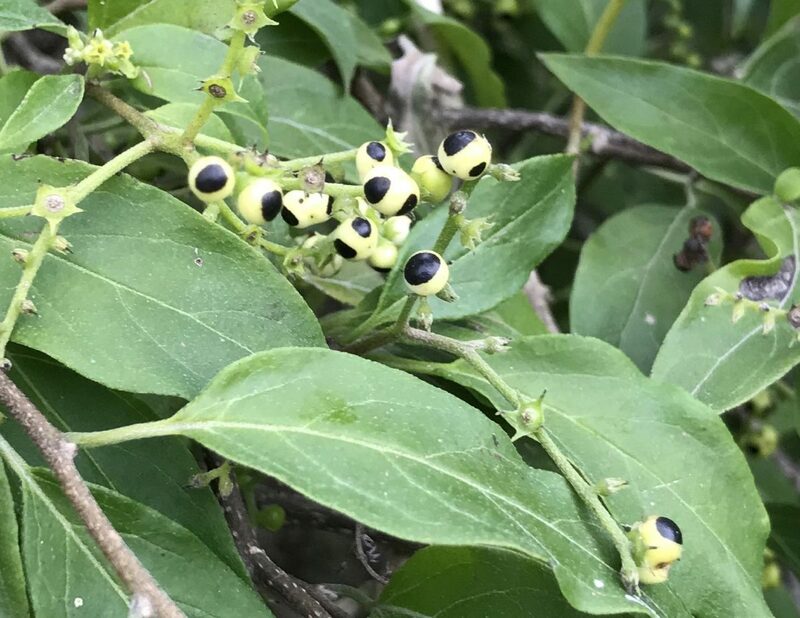 A fun thing that helps identify this interesting vine is that the seeds pods are shared like little footballs.